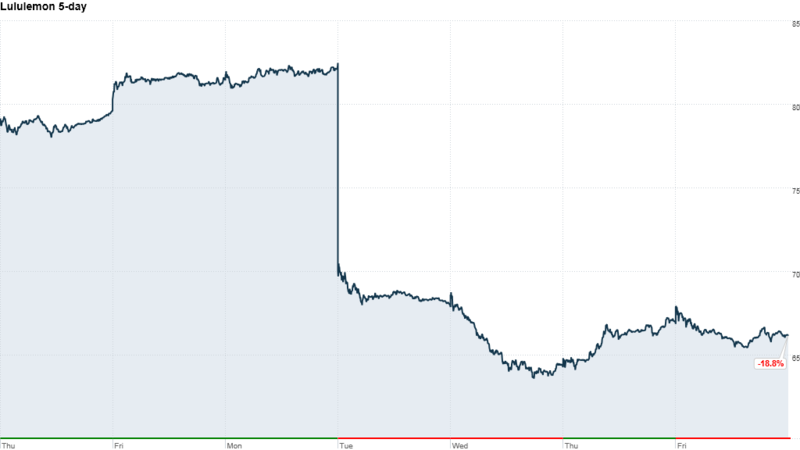 Lululemon's stock tumbled nearly 19% after the company annnounced its CEO will be stepping down. Three of the most popular stocks this past week had one thing in common: They all recorded steep declines, making them hot bargains. Investors swooped in, hoping to pocket quick gains if they recover this week. First Solar, lululemon and Facebook -- all had harsh news to contend with during the week, sending their stocks spiraling down. The low prices attracted investors, making them last week's most-bought stocks, according to data from online broker TD Ameritrade. "People are playing them not necessarily as a long-term holding, but for a bounce," said JJ Kinahan, chief derivatives strategist at TD Ameritrade. "They'll get the bounce early next week." The trigger: The solar panel maker's shares sunk almost 16% last week, after First Solar (FSLR) said it planned to sell 8.5 million shares in a secondary offering. The secondary offering should have been a positive for investors: The company swung a profit in the first quarter, and the stock has rallied nearly 70% this year to $44.71. These are prime conditions under which the company should raise more capital. But a company's stock often falls after a second offering because more shares mean that ownership gets watered down. The trigger: The trendy yoga-wear maker announced last Monday that CEO Christine Day is stepping down. The move followed a controversy earlier in the year in which lululemon (LULU) was forced to pull certain yoga pants from stores, because they were see-through. The stock was down nearly 19% for the week at $66.15. The trigger: The social media giant held its first meeting for shareholders on Tuesday. Chief executive Mark Zuckerberg faced a barrage of angry questions from investors, many of whom aren't happy with the performance of the company since it went public last year. Facebook's (FB) stock, at $23.63, is trading nearly 40% below the price of last year's initial public offering.